1. How do I order photography and other services? Ordering is simple and fast. Current clients login to MyVHT or call our Client Services Team at 800-790-8687. We also accept orders via email at support@vht.com. New clients can call Client Services at 800-790-8687 and one of our knowledgeable Client Services Associates will set up an account and assist in choosing the best service for each property’s marketing needs. 2. What is the timeline for an appointment with a VHT Studios® Photographer? Clients will receive a call by 10:00 a.m. of the next business day after order placement. The photographer will offer 2 dates with specific times. At least one date and time offered will be within 1-3 business days following the order date. For example, if the order is placed on Monday during business hours, at least one appointment time will be offered and available on Tuesday, Wednesday, or Thursday. In the unlikely event that this timeframe is not met, please call 800-790-8687 and speak to a Client Services Representative. 3. Will my VHT Studios® Photographer stage my property? Before the photographer arrives, the property should be clean, staged, and prepared for the shoot. Due to liability and risk of injury, VHT Studios® Photographers are not able to move furniture, large, heavy objects and personal items. For information and suggestions on how to prepare the property before a photo shoot, please visit www.vht.com/prepare. The photographer may choose to do some “light staging” during the shoot, which may include: aligning window treatments, closing toilet seats, turning off ceiling fans and televisions, and adjusting lightweight furniture such as dining room chairs. 4. How long does it take to receive my completed property tour? For most property tours, expect to receive the link to your customized media gallery (completed property tour) within 1 business days following the shoot date. VHT Studios® will send you an email with the link to your property tour. We will also distribute your tour to the various websites and destinations specified on your order. 1. What is the turnaround time for photography? Photography orders are delivered the next business day after the shoot. 2. What is the turnaround time for Express Orders? Express Orders are delivered by noon CST the day after the shoot. (Monday delivery for Saturday shoot). This only applies to photography and is dependent on the photographer’s schedule. 3. What is the turnaround time for Floor Plans? Floor Plans are delivered 2-3 business days after the on-site measurement appointment is completed. 4. What is the turn-around time for Video with narration? Video with narration is delivered approximately 5 business days after we complete your photographs and receive your notes on the property’s key selling features. 5. What is the turnaround time for Virtual Staging? Virtual Staging takes up to 3 business days from order form receipt using the template system. 6. What is the turnaround time for Aerial Drone Photography and Video? Aerial Drone Photography and Video is delivered 3 business days from the day of the shoot. 1. How do I preview and download my photographs? The following business day, after your shoot, you’ll receive an email with the link to preview your photographs using our On-Demand Review & Delivery System. Simply make your selections and download your images instantly to share across all your marketing and media platforms. Your photographs and tour links will be accessible through your MyVHT account. 2. How do I save a photograph to use on the web? To save a web-ready photo, simply go to your tour and select the photograph you would like to download, so that it appears in the main section of the media gallery. Go to the ”More Info” tab, then hover over “Download” and click on “Web” located under “Current Photo”. You may also download all photographs at once from the download tab in your MyVHT account. 3. How do I save a photograph to use for print? To save a print-ready photo, simply go to your tour and select the photograph you would like to download, so that it appears in the main section of the media gallery. Go to the ”More Info” tab, then hover over “Download” and click on “Print” located under “Current Photo”. ”. You may also download all photographs at once from the download tab in your MyVHT account. 1. Why is there a VHT Studios® watermark on my photos? We are committed to keeping your name in only appropriate websites and away from unprofessional practices. As your provider, we copyright every image and do everything we can to protect your photographs through our management and distribution best practices, sharing out only to media we know presents you and your brand, as well as your clients’ properties, in the most professional manner. The VHT Studios watermark assures both buyers and sellers that you have invested in professional photography, provided by the most widely used, trusted and respected provider in the industry. 2. Where can I legally use/share my VHT Studios photographs? With the copyright protection VHT Studios promises, you can confidently share your photography and related media to market and sell your listed properties while they are for sale. With our VHT Studios watermark, we will find any inappropriate use of our photographs, and if necessary, take steps to correct anything that does not represent us and our clients in the very best and most professional manner. 1. What is the process from start to finish when ordering a Floor Plan? VHT Studios offers Floor Plans and Interactive Floor Plans that can be added to your property tour. After the measuring appointment is completed by a VHT Floor Plan Specialist, the Floor Plans are created using computer software. We are also able to use existing scanned architectural drawings or blueprints to produce a VHT Floor Plan (reconstruction service). For the very best floor plan experience, you may also choose to combine our property photography and floor plan to create an Interactive Floor Plan that pinpoints locations in the illustration. 2. What is the difference between the Platinum, Gold, & Silver Photography Series? A Silver Series photograph is a high-quality professional image essential to professional real estate marketing, created using one exposure. A Gold Series photograph is an ultra-sharp image created with multiple exposures using our proprietary CLEARSHOT™ Technology. Gold Series photographs have the most brilliant color, vivid details, and clear views out of windows. Ideal for a variety of properties including luxury listings. A Platinum Series photograph takes the Gold Series to the next level and includes a consultative appointment with a Platinum certified photographer specializing in luxury properties, and is ideal for spaces with architectural details that call for a discerning approach and advanced techniques. This series also includes all add-on enhancements from our Studio Services. 3. How can I link my property tour to the MLS and other websites? VHT Studios has the ability to distribute your property tour link and photographs to a wide variety of websites and destinations. Please check with our Client Services team to learn where we can distribute your property tour and photographs to maximize the property’s exposure. For local websites, we provide a link for use on any website you choose. For MLS and IDX compliant websites that require non-branded tours, you will find the non-branded tour link under the “Links” tab in your MyVHT account and you will also find it in your “Order Complete” email. VHT offers a variety of additional distribution options, including YouTube, and you can easily share your property tour to your social media accounts (Facebook, Twitter, Pinterest, LinkedIn, and email) directly from your Customized Media Gallery page. 4. How do I syndicate my video tour to YouTube? - Login to your MyVHT account. - Select the “Publish Video” button next to the property you wish to market. - Wait for the button to say “Posted” then your YouTube link will be provided. 1. How can I cancel and/or reschedule my photo shoot? You can either contact your VHT Studios® Photographer directly or call Client Services at 800-790-8687. Please provide at least 24 hours’ notice prior to the confirmed appointment time or a cancellation fee may be assessed. 2. How do I become a VHT Photographer? If you are interested in becoming a VHT Studios® Photographer, go to www.vht.com/about/photographers to apply. 3. Where do you have photographer coverage? We have a network of photographers that covers most the continental US and HI. Our corporate offices are in Chicago and New York. Please contact us for details on a specific location at support@vht.com, or chat with us now. 4. How can I modify the captions on my photos and change the order of my photos? 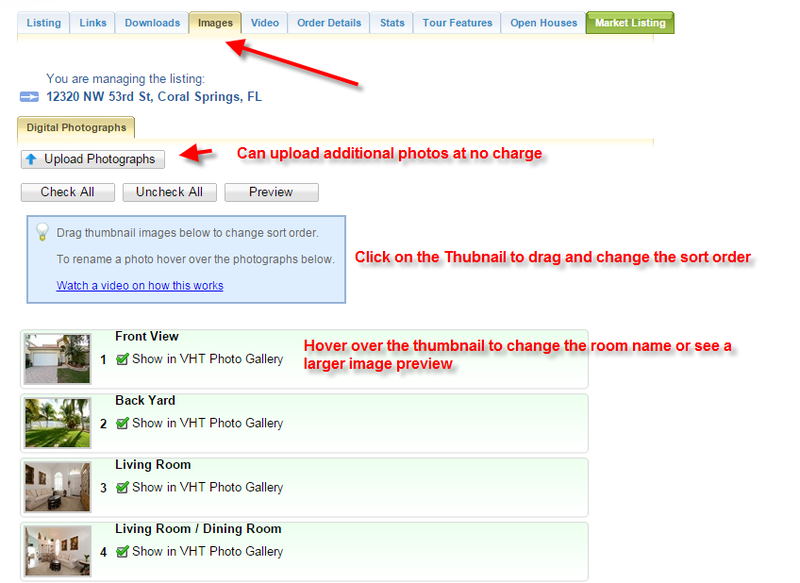 On the “Images” tab within the listing in your MyVHT account you can customize captions and change the order of photos in our Media Gallery. Go to www.vht.com/myvht to log in. Go to the Images tab, then hover over the thumbnail to change the room name. Simply click on the thumbnail and drag to change the order.